Who doesn't love chocolate? Who doesn't love white chocolate? How about chocolate chips? And booze? 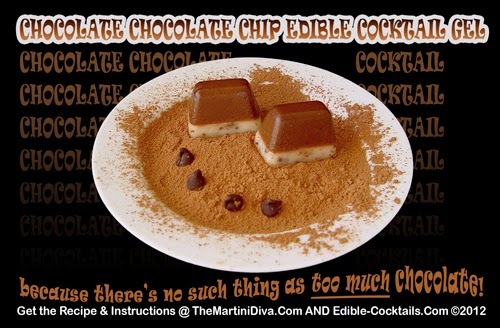 Yep, and got 'em all right here in adorable little edible cocktails for you! Yes, yes, I know. I'm evil. Measuring Cups & Spoons, Silicon Candy Mold, Large Spoon, Medium Mixing Bowls, Whip, Spray, Cooking Oil, 2 medium sauce pans. Spray your pans and/or mold(s) with cooking oil and set aside. Pour the pudding mix into a bowl and set aside. Pour in ONLY 1/2 C. of non-alcoholic liquid into pan. Sprinkle in 2 Knox Packets. Let that sit for a couple of minutes, then stir well. Warm this liquid and gelatin mixture over medium-low heat, stirring often for about 3 minutes or until the gelatin has completely dissolved, stir well and sit aside. IN A BOWL mix the REMAINING 1 cup of non-alcoholic liquid with the package of pudding mix and whip briskly for a full minute. Pour in the liquid and gelatin mixture and stir in completely. Add in the 1 cup of alcohol (the chocolate vodka and dark creme de cacao for the chocolate layer, the whipped cream vodka and white creme de cacao for the white chocolate layer) and whip mixture again, briskly, for a full minute. If you're adding anything extra, like the chocolate chip bits, fold it in here. Prepare and pour the white chocolate layer first, allow this to set for an hour, then prepare and pour in the dark chocolate layer and allow the gels to set for a minimum of four hours. Dust a pretty plate with some cocoa powder, set a few gels around in a nice configuration then add a few chocolate chips or chocolate curls. These will really impress your guests . . . if you can keep from eating them all yourself .